The weather here in Houston is getting cooler again and what is better than coming home to a warm bowl of chili with some homemade cornbread. Yum! I love it when the weather is cool or gloomy because I enjoy making some comfort food and to be tuck under the covers. For this recipe I like to make a healthier alternative to the regular chili. Not only does this recipe have low calories but it taste delightful! In a large skillet, cook the turkey and onion over medium heat until meat is no longer pink. Add garlic; cook for 1 minute longer. Drain. Stir in the tomatoes, black beans, broth, corn, tomato paste, chili powder, pepper, cumin, garlic powder, and salt. Cover and cook on low for 2-4 hours or until heat through. Serve with optional toppings if desired. Preheat oven to 375 degrees. Grease an 8 inch square pan. Melt butter in a large skillet. Remove from heat and stir in sugar. Quickly add eggs and beat until well blended and few lumps remain. Pour batter into the prepared pan. Bake in the oven for 30 to 40 minutes, or until a toothpick inserted in the center comes out clean. I hope you enjoy this recipe. Let me know if you have a favorite dish you like to eat during the rainy or cooler days. 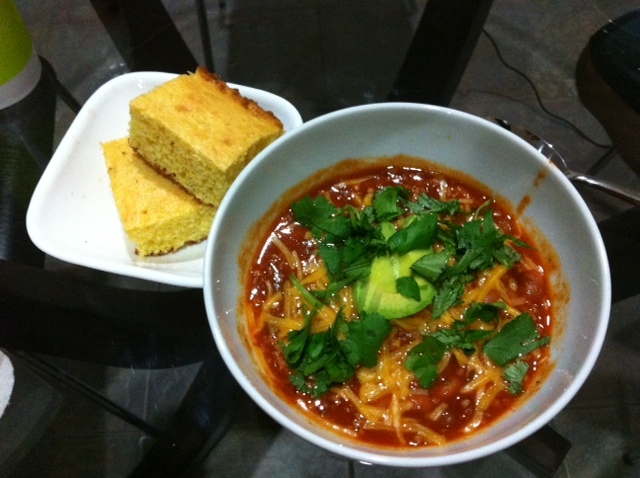 This entry was posted in RECIPES and tagged chicken broth, cornbread, dinner, food, garlic cloves, healthy, healthy recipe, low-fat shredded cheese, recipe, turkey chili recipe. Bookmark the permalink. YUM YUM YUM!! I am so happy I found your blog! I would love for you to come by and link this or another recipe at my link party!! http://domesticsuperhero.com/2013/05/02/sharing-with-domestic-superhero-link-party-9/ Hope to see you! Absolutely! Thank you for letting me share my recipe on your link party! Looks yummy! I’m hungry now! Yum! Definitely trying this out!